All soldiers know that the Purple Heart, U.S. Military’s oldest decoration, is given to those who are wounded or killed while fighting in the nation’s war. However, Purple Heart day does not simply commemorate the creation of the Purple Heart Medal. It is a day set aside to honor the wounded and fallen veterans of the United States. Many citizens are not even aware that August 7 is recognized for this purpose, while others spend the day remembering friends and family that have fallen in the battle for freedom. At EarQ, we would like to thank our soldiers for their sacrifices. Hearing loss is one of many injuries obtained in battle, and we believe it’s important to give recognition to wounded soldiers on this day. Please read on to learn more about the Purple Heart and its history. On August 7, 1782 in Newburgh, New York, General George Washington, the commander-in-chief of the Continental Army, created the "Badge for Military Merit". This was a decoration consisting of a purple, heart-shaped piece of silk, edged with a narrow binding of silver, and the word "Merit" stitched across the face in silver. The badge was to be presented to soldiers for "any singularly meritorious action" and permitted its wearer to pass guards and sentinels without challenge. During the Revolutionary War, Washington’s Purple Heart was awarded to only three soldiers. The decoration was largely forgotten until 1927, when General Charles Pelot Summerall, the U.S. Army Chief of Staff, sent an unsuccessful draft bill to Congress to revive the Badge of Military Merit. In 1931, Summerall’s successor, General Douglas MacArthur, took up the cause, hoping to reinstate the medal in time for the bicentennial of George Washington’s birth. On February 22, 1932, Washington’s 200th birthday, the U.S. War Department announced the creation of the Order of the Purple Heart. In addition to the aspects of Washington’s original design, the new Purple Heart also displays a bust of Washington and his coat of arms. The Order of the Purple Heart, the oldest American Military decoration for military merit, is awarded to members of the U.S. armed forces who have been killed or wounded in action against an enemy. It is also awarded to soldiers who have suffered maltreatment as prisoners of war. "Prior to World War II, the Purple Heart was exclusively an Army decoration." How many people have been awarded a Purple Heart? There was not a consistent record kept since the award was established in 1932; however, an estimate from the National Purple Heart Hall of Honor is that 1.8 million Purple Hearts have been awarded. While no individual can receive more than one Purple Heart, subsequent injuries for which a Purple Heart is awarded are represented by oak-leaf clusters added to the original ribbon. A number of civilians have been awarded Purple Hearts over the past 85 years. These include War Department employees wounded in action during World War II, as well as Red Cross personnel. Most famously was combat journalist Ernie Pyle, who was awarded the Purple Heart after being killed by enemy gunfire while covering the fighting on Iejima. What does it take to get a Purple Heart? The Purple Heart is awarded to any member of an Armed Force or any civilian national of the United States who, while serving under competent authority in any capacity with one of the U.S. Armed Services after April 5, 1917, has been wounded or killed, or who has died or may hereafter die after being wounded. 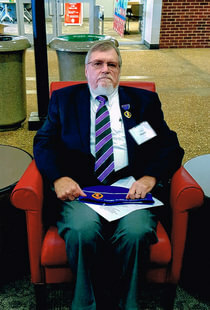 Purple Hearts are not awarded to service members suffering from such conditions as heat exhaustion, frostbite, trench foot, food poisoning, communicable diseases and infections, self-inflicted wounds, and post-traumatic stress disorder to name a few. Those wounded or injured as a direct result of friendly fire. Or when injured by your own non-projectile weapon or projectile weapons fire while engaging, responding to or attacking an enemy. POWs injured or wounded as a result of individually directed conflict or punishment with their captor in violation of any article of the Geneva Convention Rules of Warfare Concerning the Treatment of Prisoners of War whether or not the captor’s government is a signatory to the Convention. 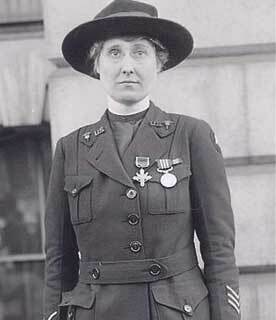 Beatrice is the first known woman to be awarded the Purple Heart due to injuries received during World War I. Beatrice, an Army nurse was working in a British Clearing Hospital four miles behind the lines in Belgium when a German aircraft bombed the hospital. The injuries caused her to lose her right eye, but Beatrice remained in the Army and served throughout the war. Douglas MacArthur, George S. Patton, and Norman Schwarzkopf have more in common than just being famous Army Generals; they each have been awarded the Purple Heart. Schwarzkopf is the recipient of two Purple Hearts for injuries during his service in Vietnam. Douglas MacArthur was awarded two for his World War I service. MacArthur had #1 engraved on his Purple Heart as he insisted on being the first recipient of this decoration he fought to resurrect in 1932, based loosely on the defunct Military Badge of Merit. Patton also was awarded the Purple Heart retroactively for his combat wounds after the award was created in 1932. Robert Patrick "Rocky" Bleier was drafted into the U.S. Army in 1968 during the Vietnam War. This was following his rookie season playing for the Pittsburgh Steelers. While serving, Rocky was wounded during and ambush on his platoon. He was later awarded the Bronze Star and Purple Heart. In 1970, Rocky rejoined the Steelers camp. He couldn’t walk without being in pain and was placed on the injured reserve for the season. In the 1971 season, Rocky returned and played on special teams. He tried to get increased playing time for several seasons and never gave up. In 1974 he earned a spot in the Steelers’ starting lineup. American lawyer and politician, Robert (Bob) Dole received two Purple Hearts for injuries received during World War II. The injuries left him with limited mobility in his right arm, which is why you will often see him with a pen in his right hand to try to minimize the effect. Prior to serving as the 35th President of the United States, JFK received the Purple Heart for injuries incurred while serving in the U.S. Navy Reserve during World War II. Pat walked away from a $3.6 million contract with the Cardinals to enlist in the U.S. Army after the September 11 attacks on America. Tillman completed Ranger School and was deployed to Afghanistan where he was killed in action. 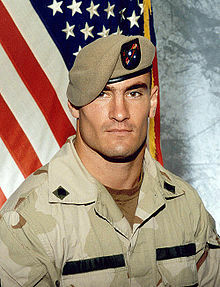 While there was controversy over his death, Pat was awarded the Purple Heart. Academy Award winning screenwriter and director, Oliver Stone was awarded two Purple Hearts for injuries during the Vietnam War. He received other military awards including the Bronze Star with "V" Device for heroism. Another interesting fact is that Ronald Lawrence Kovic—the story behind Oliver Stone’s Born on the Fourth of July movie—was also a Purple Heart recipient. Former Prisoner of War, John McCain, was awarded two Purple Hearts for his service during the Vietnam War. After returning home, John became a career politician and ran in the 2008 presidential election which he lost to Barack Obama. There have been many famous actors who were awarded the Purple Heart for injuries during their time of service as well including Charles Bronson, James Garner, James Arness, James Jones, and Rod Serling. The Purple Heart is not just for humans—there have been several noteworthy instances of non-human recipients as well. 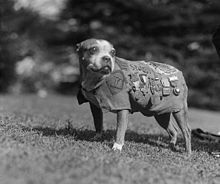 Sergeant Stubby, a K9 war hero and most decorated dog of World War I, was awarded the Purple Heart for an injury caused by shrapnel from a German grenade thrown into the trench he was in. Most recently Rocky, a military working dog deployed to Afghanistan was awarded the Purple Heart for injuries from shrapnel after an improvised explosive device (IED) went off near him and his handler, Specialist Andrew Brown. "It is against U.S. law to buy or sell Purple Hearts." An unfortunate consequence of war is injury to those fighting, including some which are fatal. Noise-induced hearing loss is the number one disability produced by combat in war today according to the United States Department of Veterans Affairs (VA). Since 9/11, the VA reports that more than 94,000 veterans are suffering with tinnitus, or ringing in the ear and another 78,000 have experienced hearing loss. Whether Army, Navy, Air Force, Marines or the Coast Guard, the price paid by many military service has been permanent hearing damage. Hearing damage covers a range of hearing-related ailments from ringing in the ears, to damage to the eardrum, inner ear, or auditory nerves. Nearly 933,000 Veterans receive disability compensation for hearing loss and over 1.3 million Veterans received compensation for tinnitus. Tinnitus is the number one disability among Veterans and is affects at least one in every 10 adults. Veterans have higher rates of tinnitus than the general public due to the noise levels they encounter while in service, including gunfire, machinery, aircraft, and more. As much as hearing loss related injuries seem to go hand and hand with War, neither hearing loss nor tinnitus alone justify the award of a Purple Heart. In most cases there is no specific cure for tinnitus, with the right approach Veterans can learn to self-manage their reactions to it through various methods including: concentration, relaxation exercises, white noise, and hearing aids. If you or a family member has experienced hearing damage, it’s important to visit a hearing healthcare professional and see what options are available to you. 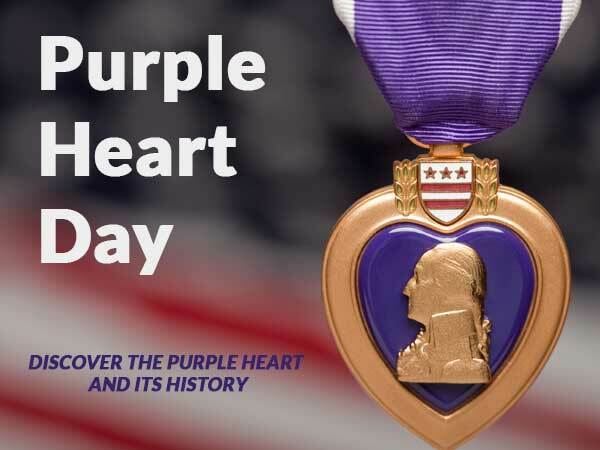 On Purple Heart Day, many military organizations hold events or functions that remember all Veterans; those currently deployed and Purple Heart recipients. Among the various organizations which honor our Veterans, some are specifically devoted to the recipients of the Purple Heart: Military Order of the Purple Heart, Purple Heart Foundation, and the National Purple Heart Hall of Honor are a few of them. The National Purple Heart Hall of Honor offers visitors an incredible journey through military history as well reminders of human sacrifice and the cost of freedom. You can visit their 7500 square foot facility at the New Windsor Cantonment State Historical Site located in New York’s Hudson River Valley. In 1932, 137 veterans of World War I received their awards on the very same grounds. Regardless of what day it is, time spent remembering and appreciating the Veterans who fought to defend the rights given to American citizens, is time well spent. Simply flying the American flag at your home will help show support to those who paid the ultimate sacrifice and those who are currently laying their lives on the line protecting our liberties and freedom.